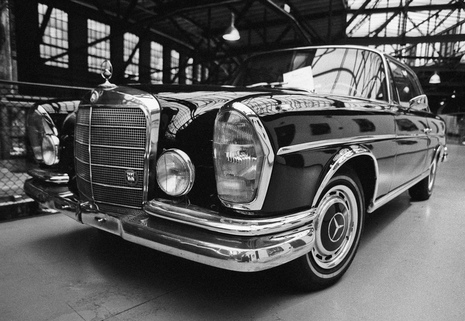 The Mercedes-Benz W108/W109 model series was a large luxury car line built by Mercedes-Benz from 1965 through 1972. The W108/W109 was a replacement for the higher end of the "Fintail" sedan range, with three-box styling similar to the W111/W112 coupes. The somewhat controversial fins of the earlier so-called "Heckflosse" W111 were eliminated by designer Paul Bracq. The engine in the W108 was based on that fitted in the earlier W111, but the availability of higher octane fuels allowed for a higher compression ratio while the modestly increased weight of the car called for more power. Cylinder bore and stroke both grew, giving rise to a total increase in cylinder capacity of 301 cc to 2,496 cc. A change from four to seven main bearings was necessary in order smoothly to handle the resulting increase in power. A larger capacity oil pump was also specified. Con-rods were slightly shortened, reflecting the 6mm longer stroke in a block of unchanged overall height. The redesigned cylinder heads incorporated larger ports, and the cylinder valve diameters were increased by 2mm. On the fuel injected cars a six-plunger pump replaced the previous car's two plunger pump and the injectors were repositioned to give a more direct angle towards the inlet valve heads. The engine cooling fan now had six blades instead of four and incorporated a viscous coupling which activated the fan only when engine speed exceeded 3,000 rpm or the radiator water temperature reached a preset limit. The 2,996 cc aluminium-bloc unit fitted in the W109 in 1965 was very little changed from the unit fitted in the previous W112 Mercedes 300 SE, still delivering 170 PS. The cylinder capacity of the three litre Mercedes engine was indeed unchanged since 1951. However, in the two years till 1967 during which the larger engine was listed for the W109 fewer than 3,000 of these cars were produced, the plant concentrating instead on producing approximately 130,000 of the less powerful 250 S/SE models during the first two years of the W108/109's existence. By 1967 the fuel consumption of the 3 litre unit in this application was becoming increasingly uncompetitive. 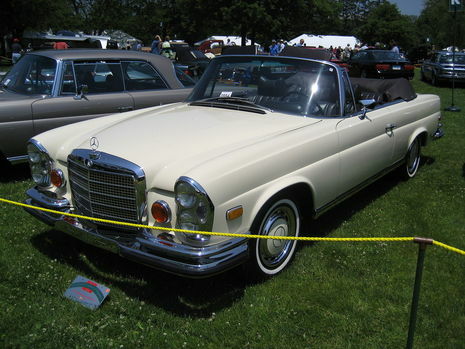 The 300SEL 6.3 was the most exclusive and extravagant Mercedes money could buy, except for the 600. The 6.3 engined V8 300SEL was launched in March, 1968: it used the engine first seen in the 600 model, which equipped the lighter bodied W109 for a claimed headline grabbing 0-60 mph (0–96 km/h) time of 6.3 seconds. US market detoxification requirements sapped the performance a little west of the Atlantic, but the 300 SEL 6.3 was nonetheless the flagship model in the Mercedes line-up. It was deemed by many the world's best car and fastest production saloon, and held this title for many years. Note: The picture on the right is a W111 Cabriolet. Styling of W108 models were based on the W111/2 Coupe and cabriolet models. 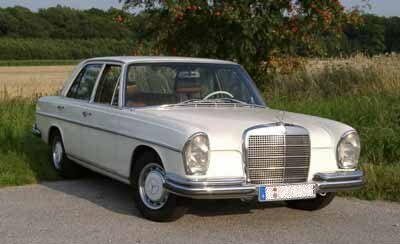 The Mercedes-Benz W108 and W109 vehicles were built in Stuttgart in then West Germany, from 1965 until 1972. Although production ended in 1972, some vehicles were marketed and sold as 1973 model year versions in North America. They were typically late-production vehicles, and some didn't arrive in North America until 1973. The 108 and 109 Chassis Mercedes Benz vehicles are the last truly hand-built S-Class Mercedes vehicles (aside from some current AMG models). Starting with the 116-chassis, production was moved from a team, responsible for the entire vehicle from inception to the final touches, to an assembly line for efficiency. This allowed Mercedes to produce more vehicles in the same amount of time. The 108 and 109 vehicles were also the last vehicles with the infamous "Mercedes look" - stacked headlamps (on NA versions), curvy hoodlines, and a very large front grille. To this day, many people can still recognize a 108 or a 109's lines as distinctively Mercedes, even if they were not even born when the model was still in production. The two major chassis variations of this body style - 108 and 109 - referred to the vehicle's suspension system. 109 vehicles were mostly air-suspension vehicles (with a few early exceptions), and 108 vehicles had coil springs on all 4 wheels. The smallest engine available was the 2.5L inline 6 in the 250S and 250SE models, and the largest was the 6.3L V8 in the legendary 300SEL 6.3. The variations were S, SE and SEL: Saloon, Saloon Einspritz, and Saloon Einspritz Lang. The S versions were carbureted, the SE versions fuel injected, and SEL versions fuel injected with longer wheelbases. All 108 and 109 vehicles had overhead cam engines.